So I’ve been having some problems with my server for a month or so–periodically the number of apache servers would skyrocket and the box would get so overloaded (load of ~50 or so) that I couldn’t even run simple commands on it. I would have to get into the hardware console and give the box a hard boot (a graceful reboot wouldn’t work). Root cause is I’m a dork, but more about that later. Anyway, I needed a way to troubleshoot and fix it. The biggest problem I had was that the problem was very sporadic–sometime it would be 2 weeks between crashes, other times it would be 3 times in one day. This is so begging for a stress-test really badly. Looking on the Internet, I found a couple of articles about running a load-tester on apache and information on the tuning settings but not really much about a methodology (yeah yeah I work for a Big 4 firm, the word still makes me shudder even though it’s the right one to use here) to actually solve the problem of apache tuning. One server running apache. Mine runs Apache2 under Debian Stable. This is a little bit different from the average distro out there in that the process is apache2 and the command is apache2ctl where normally you would have httpd and httpdctl. If you try this at home, you’ll need to use the latter commands. An apache tuning guide or 3. Here’s the simplest/most straightforward one I’ve seen. A stress-tester. Siege is awesome for this. Some simple shell commands: htop (top works here too), ps, grep, and wc. OK, so far so good. I’ve got 11 threads running with no load and RAM usage of 190MB. I needed the extra “grep start” because it removes the text editor I have open on apache2.conf and anything else I might be doing in the background. I also killed apache, waited 10 seconds, and looked at the typical RAM use. With no apache running, I use about 80MB just for the OS and everything else I’m running. This means that I’m using 110MB of RAM for 11 apache threads, which means I’m using ~10MB of RAM for each apache thread. Now that’s something important I can use. Notice how the MaxClients is set at 150? This will prove to be my downfall later. Turns out that my server is RAM-poor for as much processor as it has or WordPress is a RAM hog (or both, which is the case =) ). I’ll eventually upgrade my server, but since it’s a cloud server from Mosso, I pay by the RAM and drive space. Syntax OK                        <- If something else comes back, fix it!! I’m sure there is an efficient and fun way to make this, like say, a text-only sitemap or sproxy which is made by the same guy who does siege, but since I only needed about 30 urls, I just cut-n-pasted them off the blog homepage. ** Preparing 50 concurrent users for battle. <-The guy writing siege has a wicked sense of humor. The server is now under siege...                <-Man the ramparts, Apache, they're coming for you! Elapsed time:                6.70 secs   <-have to scroll through all that output from the real test. There is one setting that is the most important in tuning apache, it’s MaxClients. This is the maximum number of servers (with the worker module) or threads (prefork module). Looking at my apache tuning guide, I get a wonderful formula: ($SizeOfTotalRAM – $SizeOfRAMForOS) / $RAMUsePerThread = MaxClients. So in my case, (512 – 80) / 11 = 39.something. Oops, this is a far cry from the 150 that comes as default. I also know that the RAM/thread number I used was without any load on apache, so with a load on and generating dynamic content (aka WordPress) , I’ll probably use ~15MB per thread. 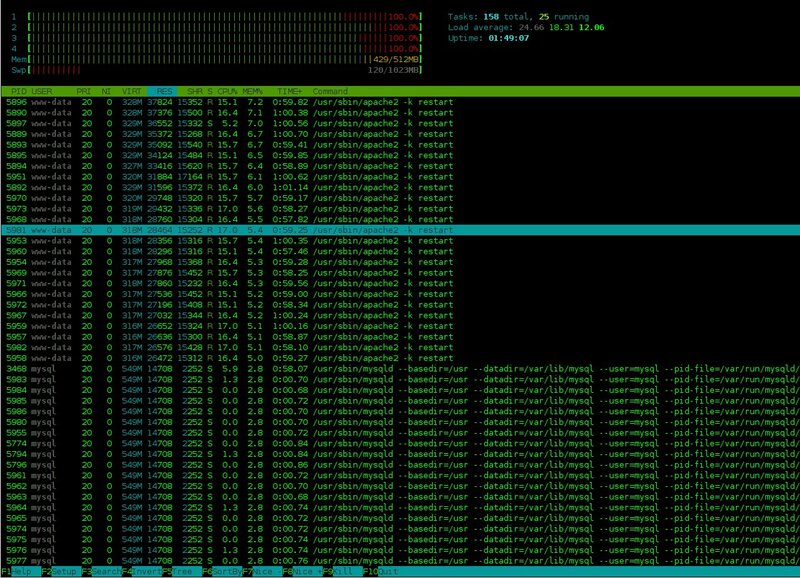 One other trick that I can use: Since I think that what’s killing me is the number of apache threads, I can run with a reduced amount of simultaneous connections and watch htop. When htop shows that I’ve just started to write to swap, I can run my ps command to find out how many apache threads I have running. Now this is about what I expected: With 28 threads going, I tipped over into using swap. Reversing my tuning formula, I get (28 threads x 15 MB/thread) +80 MB for OS = 500 MB used. Hmm, this makes much sense to me, since the OS starts swapping when you use ~480MB of RAM. So I go back to my prefork module tuning. I set MaxClients at 25 because 28 seems to be the tipping point, so that gives me a little bit of “wiggle room” in case something else happens at the same time I’m serving under a huge load. I also tweaked some of the other settings slightly. Then it’s time for another siege torture session. 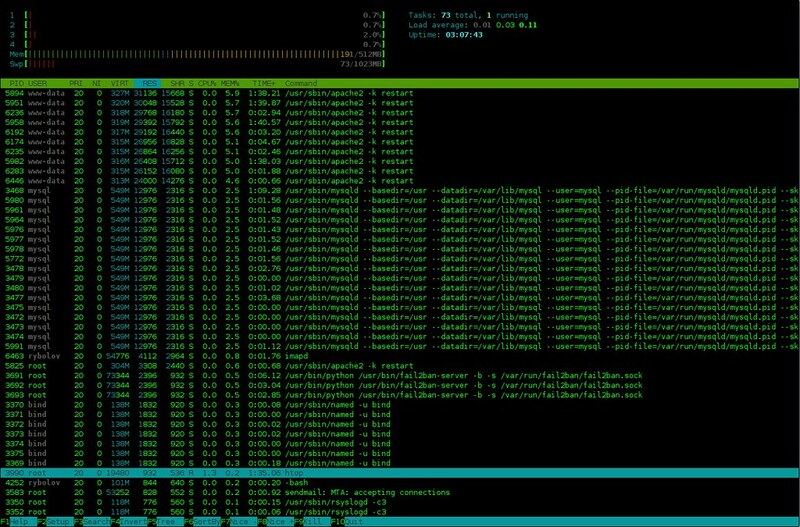 I run the same command as above and watch the htop output. With the tuning settings I have now, the server dips into swap about 120MB and survives the full 10 minutes. I’m sure the performance is degraded somewhat by going into swap, but I’m happy with it for now because the server stays alive. It wasn’t all that smooth, I had to do a little bit of trial and error first, starting with MaxClients 25 and working my way up to 35 under a reduce siege load (-c 25 -t 60s) to see what would happen, then increasing the load from siege (-c50 -t 600s) and ratcheting MaxClients back down to 25. We have all these data wonks running around now in the information security field thanks to a couple of people (Jaquith, Shostack, Stewart, and our friends at Verizon Business) who brought us some books and some data. Well, earlier this year, the Government started a website called Data.gov. This is much awesomeness, Viva Las Transpareny! However, it’s missing something very relevant to my interests: information security management data.